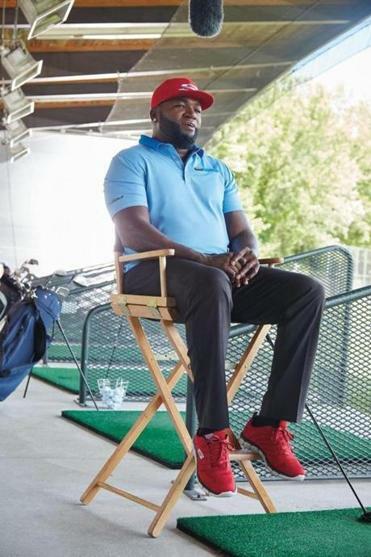 “Big Papi Needs a Job” premieres Wednesday at 8 p.m. on Fusion. It’s been more than a year since David Ortiz hung up his cap and waved goodbye to Fenway Park after a legendary run of awards and championship rings with the Red Sox. So what’s Big Papi been up to in retirement? Well, reality TV: Ortiz has taped 10 half-hour episodes of “Big Papi Needs a Job,” a new show on Fusion that follows him as he tries a number of different occupations, from musician to manicurist to firefighter. We spoke to Ortiz via phone ahead of the show’s premiere Wednesday at 8 p.m. to talk jobs, retirement perks, and, shockingly, baseball. Q. So tell me a little about your show. A. It’s about me trying to get a new job, since I retired a year ago. I’ve been pretty busy doing things, but then my agent wanted to get me busier than I already was! Really, the show is just me being me, and people who have just seen the baseball will get to see me trying to do something different. I’m into it, and it’s going to be pretty fun to see. Q. What have been some of the biggest takeaways from trying jobs outside of your comfort zone? A. We did nothing crazy or dangerous; just things people normally do on a daily basis. Sometimes they’re things you’d think are easy to do, but once you’re in the situation you’re like, “Oh, I ain’t doing that!” So it’s been funny, and it’s helped me get an idea about all the things people do. I did jobs that I used to take for granted before, but now I be like, “Man, I got respect for that guy now.” Not that I didn’t have it before, but even more now. Q. Were there any particular jobs you enjoyed? A. There’s a few that caught my attention. For example, cleaning dogs. I have dogs at my house, and there’s this truck that comes in. . . . I didn’t know what was going on inside that truck until I tried the job. It was hilarious, just how it all went down. I got a job at a coffee shop, I did something in a nail salon, a fire department, a restaurant, multiple things that turned out to be very interesting. Q. What have been some of the pros and cons to retirement? A. A big pro is I get to spend more time with my family on my own schedule more often. I played baseball in the big leagues and majors for 20 years, and during that time, I was never on my own. So now, being able to do things without worrying about a set schedule, it’s something that I’m enjoying. But on the other hand, people know that I don’t have that baseball schedule, so people approach me with so many things! They understand that I’m not as busy as when I played, so it goes back and forth. Q. What are some of the things you miss the most from baseball? A. Competition is the one thing that I’m always going to miss, and performing for the fans is something that definitely brought the best out of me. The fans here, they are frenetic; they love what they see and they expect you to do well. To me, as an athlete, I thought that was the best thing because I felt like I had to perform and deliver for them every day. Q. What were some of the best things about playing in Boston? A. I’ve got to thank the city for making me the competitor that I was. I started out in Minnesota, and the field was never that crowded while I played there; I think people thought it was kind of boring watching baseball indoors at the Metrodome. Everything was a different culture, but things changed when I got to Boston. The way people here in Boston view baseball reminds me a lot of the way we do it back home in the Dominican Republic, because people expect you to be consistent and the best when it comes to competition. That’s why Boston is such an incredible sports city. Q. What do you think of the Baseball Hall of Fame inductees (Chipper Jones, Vladimir Guerrero, Jim Thome, Trevor Hoffman) announced recently? A. The choices were perfect. I’m more than happy to see those guys get inducted into the Hall of Fame, and I’m a big fan of all of them. Q. How do you personally feel about your own prospects? A. I’ve still got a long way to go. I’ve still got like, what, four years to go [before I’m eligible]? So a lot of things have to happen before I get there. But if I get to be one of the Hall of Fame members, I’d be more than happy.